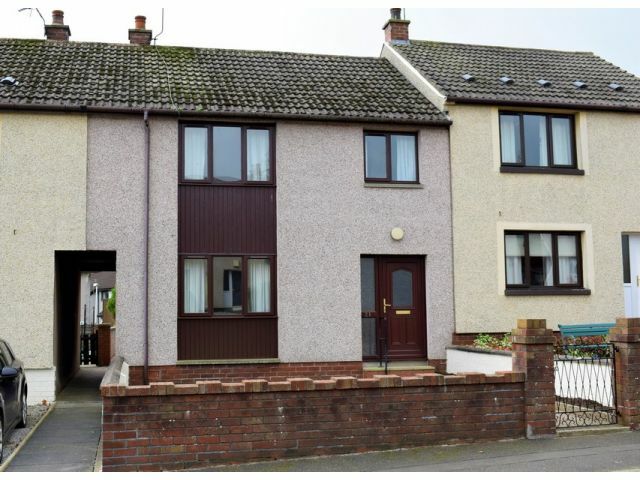 Located in the popular village of Ecclefechan, which is ideal for commuting North & South via the M74 and has various amenities including a Post Office, Primary School, GP Surgery and Village Hall. Comprising of: Spacious Lounge, Kitchen with Dining Area, Two Double Bedrooms, Single Bedroom and Shower Room. Generous Enclosed Gardens to Front and Rear with Garden Shed and Greenhouse. Requiring a degree of cosmetic modernising throughout, this family home is offered for sale for an excellent price! Coving, ceiling light, smoke alarm. Telephone point. Electric radiator, carpeted flooring. Windows to front and rear with curtain poles. Coving, two ceiling lights, three wall lights, TV point. Electric living flame fire with feature stone surround and hearth. Two electric radiators, carpeted flooring. Window to rear with blinds. Two ceiling lights, extractor fan, under stair storage cupboard. Range of wall and base units, integral double oven with electric hob. Stainless steel sink and drainer with mixer tap, plumbing for washing machine. Space for fridge freezer. Splashback. Vinyl flooring in kitchen and carpet in dining area. Loft access. Ceiling light, smoke alarm. Electric radiator, carpeted flooring. Window to rear with curtain pole. Coving, ceiling light, telephone point, TV point. Range of fitted furniture. Electric radiator, carpeted flooring. Window to front with curtain rail. Coving, ceiling light, two storage cupboards (one housing water tank). Ceiling light, electric radiator, carpeted flooring. Window to front with curtain rail. Coving, ceiling light, electric radiator, carpeted flooring. Opaque window to rear with blinds. Coving, ceiling light, extractor fan, wall heater. Toilet, wash hand basin and walk in shower unit with electric shower. Fully panelled. Heated towel rail, vinyl flooring. Enclosed front garden with mature borders. Enclosed rear garden with lawn and patio sections, greenhouse and garden shed. Offers in the region of £80,000 are invited and should be submitted to lj Residential, 93 High Street, Annan, DG12 6DJ or by fax to: 01461 205037. Ideal First Time Buyers Home!